The top-end sparkle of the $64,300/pair of the Acapella High Violon IV was absolutely addictive. As driven by a $32,700 pair of the Einstein OTL monoblocks, with Einstein's $16,900 "The Source" tube balanced CD player, the top-end definition and extension of the Acapella showed an exemplary level of tonal sophistication and control. It was not soft and serene, but well-formed and true to the source. I am not a big OTL fan, partially due to the fact that Brian never sent a pair of the OTLs to me for auditioning, hence the lack of qualification on my part to offer review impressions. That said, my numerous encounters of the two pairs of the OTLs driving Acapella's $198k Triolon Excalibur tell me that the Einstein OTL is a legend in the making. Magic also abounded with the High Violon IV playing piano solo, especially when it was a Deutsche Grammophon disc with Emil Gilels playing Beethoven's Piano Sonatas. You've got to hear what the ion tweeters are doing to the piano sound. Never had I heard piano with so much textural liquidity, and at the same time not devoid of substance, that possessed so much tonal richness that it was utterly convincing. 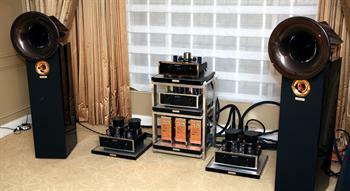 Einstein OTL monoblock amplifier, with two of the 19lb Acapella Big Block ($1,400 each) atop the transformers for mechanical resonance damping. Isoclean continued to have a pronounced presence, this time with no less than 3 of the $3,500 PT 3030G III power transformers, 3 of the $4,200 80A3 power filter and a sleuth of the company's best cables. In my personal experience, the company's $2,100 2-meter Super Focus power cable can elevate any component's performance significantly, while the $4,000 Supreme Focus went beyond improving equipment's performance in my review of it and made the connected components sounding unrecognizably superior. For an audiophile, the Supreme Focus is serious fun; but for the reviewer, the Super Focus is good enough to push the performance envelope of equipment without making them sound out of character.